J. C. Wiatt (Diane Keaton) has it all in a grey-suited kind of way. She has corner office and a high-powered career, and she lives with another high-flyer (Harold Ramis). In 1980s New York, J.C. is about to break through the glass ceiling and make partner. Until a midnight phone call introduces a tiny distant cousin into her life. Fortunately she has an out, and so after discovering why spaghetti and expensive New York apartments don't mix, she takes the child to an adoption agency. I just couldn't hand her over to a woman who called her husband "sir", it gave me the chills... suddenly I saw her in frosted lipstick wearing a Dairy Queen uniform. 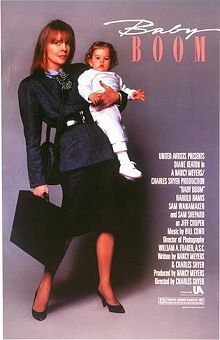 Baby Boom has four parts: first the comedy of a yuppie couple with a normal child in their pristine, highly-ordered apartment. Second, J.C. as the woman trying to balance the life of a corporate executive with single motherhood. Next, we have the fish-out-of-water life of J.C. snowbound in Vermont, and finally the life she makes that has room for people, for love, and for an impressive business success. No one really wants it all, but sometimes we want more than we need, and it is only when we really know what will make a satisfying life for ourselves that we can reach out for it. Despite the vintage, this movie stands up as a story about real people facing real challenges.